The American Hairless Terrier was officially recognised by the A.K.C. in 2016. 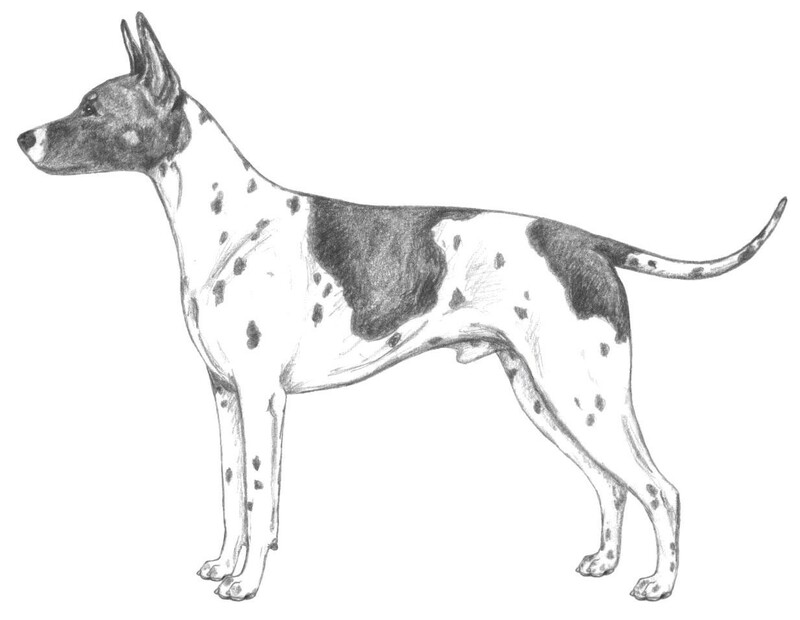 The history of the American Hairless Terrier was identical to that of the Rat Terrier until the 1970s. The AHT, as they’re sometimes called, is the product of a rare, major mutation that occurred in a litter of Rat Terriers in 1972. A completely hairless puppy with pink skin and black spots was born in a litter of otherwise normal Rat Terriers in Louisiana. This puppy became the foundation for the American Hairless Terrier Breed. The American Hairless Terrier is a small to medium sized, smoothly muscled and active terrier. Medium bone, not so heavy as to appear coarse or so light as to appear racy and blends with the proportion of the dog. The overall appearance is strong but moderate with firm, smooth, flat muscles. The lack of coat on the hairless variety of the American Hairless Terrier renders them unsuited for most hunting activities. They have, however, retained a strong hunting instinct and excel in many other activities and sports. Given early socialization and training they excel as companions, displaying great affection for their owners and family. Viewed from the front or side the head forms a blunt wedge shape and is proportionate to the size of the body. The skull is broad, slightly domed and tapers slightly toward the muzzle. Skull and muzzle are of equal length with a moderate stop. Muzzle. Muzzle is well filled under the eyes, tapers slightly from the stop to the nose and is well chiselled. Jaws are powerful with well-muscled cheeks. Lips are tight, dry, without flews. Pigmentation of the lips match the nose. Nose. The nose is solid coloured and can be black or self-coloured. Abrupt stop, snipey muzzle and a dudley or butterfly nose are to be faulted. Serious fault: Apple head. Expression is alert, curious and intelligent. Eyes are expressive, set obliquely, round, somewhat prominent but moderate in size, and of matching colour. Eye colour varies with body colour from darkest brown to amber and hazel. When eyes are brown, a darker brown is preferred. Amber eyes are permissible for a blue dog. Blue eyes are acceptable in blue or blue fawn dogs only but grey is preferred. Eye rim pigmentation corresponds with the nose colour. An incomplete eye rim is only acceptable when the colour around that eye is white. Ears are set at the outside edge of the skull and V-shape. Erect ears are preferred however, tipped or button ears are acceptable. Both ears should match in carriage. Rose ears, flying ears, erect ears with the sides curved inward forming a tulip petal shape and non-matching ear carriages are to be faulted. The teeth are white and strongly developed meeting in a scissors bite. A level bite is acceptable. Overshot or undershot bite should be faulted. Body is rectangular being slightly longer than tall with a 10:9 ratio when measured from the pro-sternum to point of buttocks and from the withers to the ground. Length of the front leg (measured from point of elbow to the ground) should approximately equal half of the dog’s height. The loin is moderately short, slightly arched, and muscular, with moderate tuck-up and the croup is slightly sloping. Ribs extend well back and are well sprung out from the spine, forming a broad, strong back, then curving down and inward to form a deep body. Brisket extends to or just below the elbow. The chest between the forelegs is well filled and of moderate width when viewed from the front. The forechest extends in a shallow oval shape in front of the forelegs when viewed from the side. The line of the back is strong and level when the dog is standing or moving. Feet are slightly oval in shape and compact. The two middle toes are slightly longer than the other toes. Toes may be well split up but the foot is not flat or splayed. Removal of front dewclaws is optional but rear dewclaws must be removed. Flat feet, splayed feet or rear dewclaws present are to be faulted. The tail comes off the end of the croup, almost reaches hock and is thick at the base, tapering toward the tip. The tail is held upward in a slight curve when the dog is alert and may be carried out behind the dog or up in a slight curve when the dog is in motion. The tail on the hairless variety should never be docked. Bent tail, ring tail or curled tail are to be faulted. Movement is smooth and effortless, showing good reach and drive. The forequarters move without any hint of being hackney and the rear drives with power and with the hocks fully extending. This breed moves smoothly but with a jaunty attitude that suggests a dog of agility, power and speed. The legs do not turn in or out and the feet do not cross or interfere with each other. As speed increases, feet tend to converge toward centreline but do not cross. Any colour or combination of colours is allowed with the exception of albino or merle.